Leizhan is a leading manufacturer of pulp and paper plant with hundreds of working site worldwide. Leizhan engineers helps your paper making plant more effective and economical. Leizhan professional engineers design and manufacture various kinds of Chain conveyor which is used in pulp and paper industry for conveying raw material like waste paper, paper board, etc. 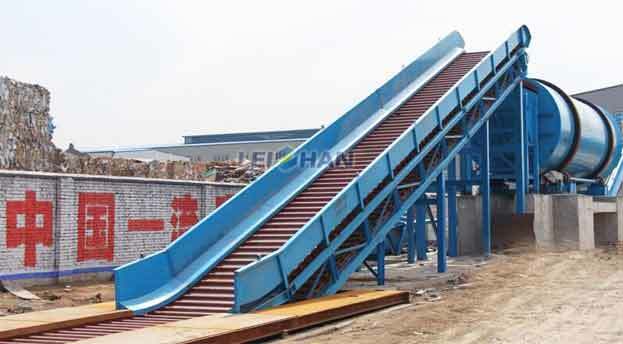 Leizhan tailored Chain conveyor can perfectly meet for paper maker’s needs. Leizhan designed and manufactured Chain conveyor consists of five parts: head drive device, tail device, tension device, chain plate and rack. It consists of motor, gear reducer, transmission device and drive sprocket gear, etc. It consists of tail shaft, driven sprocket, etc. Tension device adopts spiral taut method to adjust the tension degree of the traction chain. It consists of traction chain and trough plates. It consists of nose, tail, intermediate support.